For those of you who attended the 50th Anniversary NIADA Conference in Corte Madera, CA (near San Francisco) during the last week in June, here's the code for getting FREE SHIPPING on ALL DOMESTIC ORDERS thru my ETSY Shop: NIADAGOLDEN1; just enter that code into your shopping cart before checkout and get free shipping on everything in my Etsy shop as if that item had been at the NIADA Show & Sale! Code good through August 31, 2013! Check back soon for photo updates from the Conference! And Thanks again to all who came to see me! New Works: Lions, Flamingos and Bears, Oh My! Without further ado, a group photo of my latest kiln-bounty after MIXing the luscious black Cassius Basaltic Stoneware with its closest ceramic compatibility cousin, Arctic White Stoneware (both available through Mid-South Ceramic Supply) and then adding dry pigment stains INTO the clay bodies. Im getting a little giddy over the results. P.S. : there are a few new listings in my Etsy shop from this troup as i resist the temptation to keep them all and make them into finished dolls. But there are MORE coming, and kits to assemble, and my Gallery Night piece to decide on, etc. 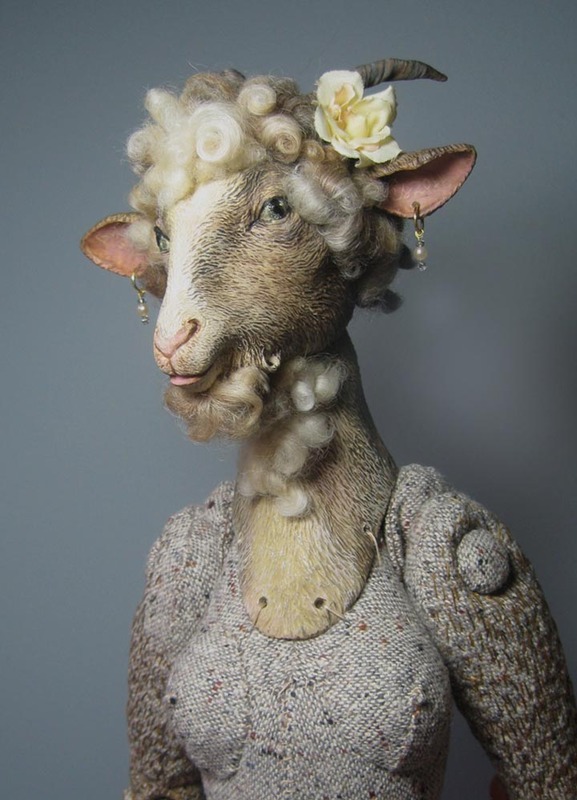 Just a quick update to let everyone know that I am teaching an Anthropomorphic Doll Bust Sculpture Class at the NIADA School immediately preceding the Conference in San Francisco, June 2013. I will be posting a few 'teaser' articles over the next few weeks to promote the class and also hope to be offering similar classes in the New York-Tri-State area, so if you know of a venue you'd like me to look into, please feel free to drop me a line at doters369@gmail.com ! I will basically be teaching students how to prepare and sculpt stoneware clay into slabs and hollow cones from which to create their own one-of-a-kind anthropomorphic busts on which to base a doll. I will cover various species of animal heads; birds, mammals, reptiles, fish; and we will be exploring character, surface detailing, and incorporating high-fire ceramic stains into the clay before firing. 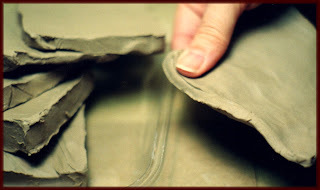 The two-day class will conclude with demonstrations in hand- and feet- or shoe-sculpture. If students arrive at a set of doll parts that they like and want to preserve for the trip home, access to her studio kiln has graciously been offered by Stephanie Blythe, and we'll let the finished pieces dry, and fire them for any students that are staying through the end of the conference. An added 'bonus' for conference attendees: I plan to offer a free demo on my process of waxing fired wares before assembling them into finished dolls, with preference given to students' work created in the class! More forthcoming; I am presently working up figures for the upcoming NIADA Conference and will have updates soon! Running around like a madwoman with too many (just enough) projects. Writing about what i'm doing seems a superfluous luxury right now. Just DOING it at the moment and will hopefully have a moment (when the mad rush thins a bit) to pop in and embroider it with description and explanation where any might be needed. Below is a tray of recently finished stoneware busts and limb sets for my Etsy shop. More coming. Working too on several commissions and the initial throes of a lifelong dream: taking Animation Classes at NYU... more on THAT as soon as i finish my Final Project for the first class: Concept Art &Character Design. I'm stressed, have resorted to the worst of my eating/sleeping habits as i careen from one project to another, and am loving every minute of it. The thought of trying to work in time to blog about it seems fairly absurd. So why not? 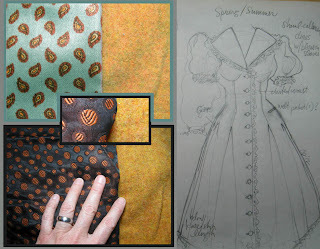 Dusting Off the Blog: A Peek at "Nellie Also"
Well it's been ages. No excuses, and a brief apology... irons in the fire must make room for one more. Without further ado, a brief visitation to my worktable for a glimpse of what's coming to doters.etsy.com. 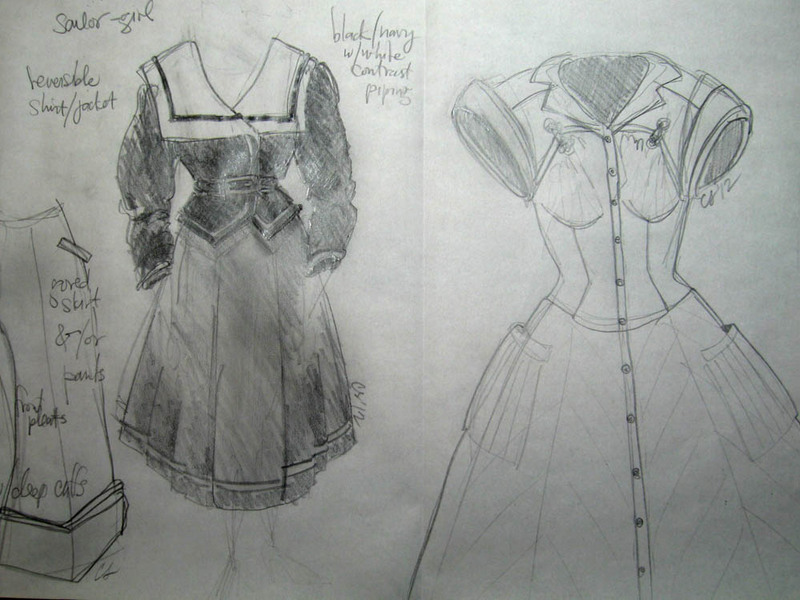 I am inexplicably and delightfully visited by a herd of lovely people from all over the globe who commission GOATS from me; of both regular and anthropomorphic persuasions); the newest 'kid' on my block is named Nellie, and she's getting fitted with a wardrobe of 1940's style dresses constructed out of vintage fabrics. This Nellie is a reprise of a commission done for a collector in Washington D.C., who's a sheer delight to collaborate with... more on her shortly. The first of three is a sweetheart dress with a shawl collar done up in a swingy black fabric dotted with jazzy orange graphics that look a bit like balls of yarn... 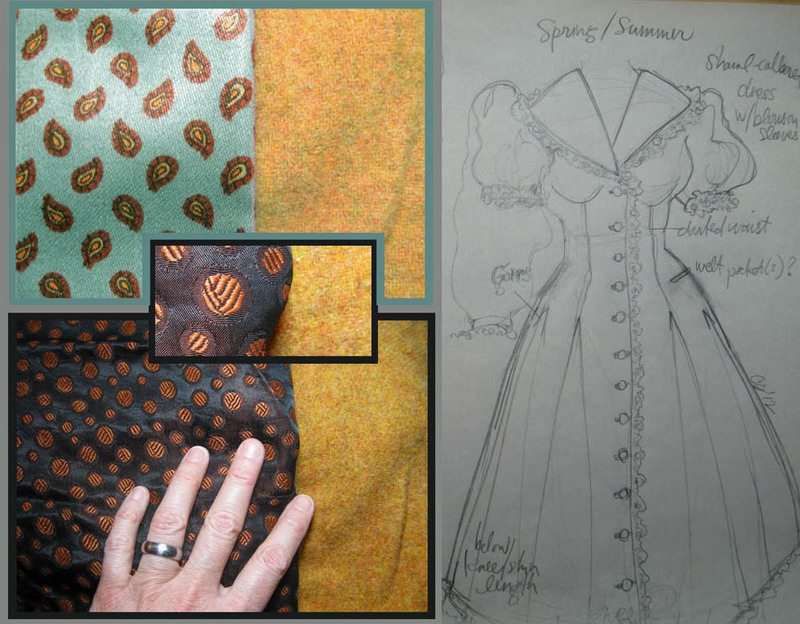 Above is a sketch and swatch, along with a glimpse of the dress in progress, below. Once the collar's on, i'm making a smart shrug of that bright, yellow-orange heathered wool to the right of the swatch fabric above. This ensemble also gets a sheer black organza slip that will share double-duty with dress number two. 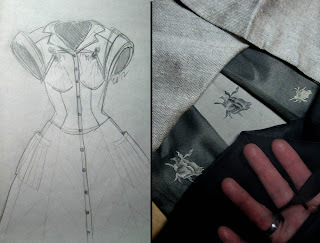 ..
...which will be an elegant mix of black and silver shot silk and linen with a rose motif on a pieced bodice, and a floral sailor-inspired ensemble, which will show up next post. Proud to announce: i'm on The Imaginarium Team on Etsy! --And so eager to dig in and get acquainted!! Team Leader Priscilla http://www.readbetweenlines.etsy.com/ very graciously included one of my new reliquary pieces in a new 'all-Imaginarium' team treasury... check it out here! More updates soon to come; i'm so inspired by the talent on this Team!! anthropomorphic sculptor of 20+ years, i have my own shop on etsy and aspire to animate my own stop-motion short films.